If your business depends on people finding your website, then this will be an anxious day for you. Google is making changes to the way its search engine ranks sites, and that could send some hurtling down the rankings. Of course, the company tweaks its algorithm on a daily basis as it battles with Search Engine Optimisation (SEO) specialists who try to game the system on behalf of their clients. But this is a big change - dubbed "mobilegeddon" by some - designed to favour sites that are optimised for the mobile internet. Google gave plenty of warning, telling developers about the change in a blog post in February and providing a simple tool to check whether sites were mobile friendly. The search firm is trying to reassure website owners that this won't be an earthquake which turns their businesses upside down but quite a subtle evolution. But SEO specialists say this looks like the biggest change since 2011 - and for some that will unearth some unpleasant memories. For any online retailer, appearing on page one of Google's search results can make all the difference between a profitable business and one heading for the scrapyard. Just ask Jenny Hurren, owner of a furniture retailer called Out There Interiors which sells its products exclusively online. Search Google for "mirrored furniture" and her site pops up on page one - though made somewhat less obvious by the paid ads and the Google shopping box, which Jenny says is far too expensive for her. But in 2011 when Google released the Panda update to its search engine, disaster struck. "We went from having page one positions, to being nowhere or page six or seven," she remembers. "It had a massive impact, we almost lost the business because of that algorithm change." Since then, she has tried to depend less on crude SEO techniques, more on the kind of PR which will get the firm linked to from high-quality sources, and so boost its search ranking. Now she is not so worried about the latest change because the work has been done to make the site mobile friendly. "It should be good for us - our site is ready, many of our competitors aren't." But Jenny says she's also learned a key lesson - not to be so completely dependent on Google searches for her business. My next search was for something specialist - "buy outsize shoes". 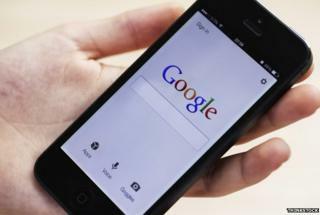 A quick check of the sites on the first results page seemed to show that most would pass Google's mobile test. But when I contacted a firm called Magnus Shoes, the owner Simon Drinkwater admitted that he had been a little concerned when he heard about the latest Google update. "We are just in the middle of upgrading to a mobile-friendly site," he told me. I ran a check on another page of his site and found that, yes, Google was listing it as "not mobile friendly", with the text too small and the links too close together to be comfortably read on a phone. Mr Drinkwater said he would be concerned if the site slipped off page one of the search results, but didn't think it would have life-threatening consequences for a business which, unlike Out There Interiors, was not born on the internet. "We've got thousands of loyal customers who know where we are." Still, he concedes that winning new customers would be very hard without a prominent position in a search for outsize shoes. Google's move to make mobile capabilities more important in search rankings seems eminently sensible as our phones become the key route to finding goods and services online. But over the next few weeks we can expect cries of pain from those whom the all-powerful search algorithm has deemed less worthy. And, coming just days after the European Commission accused Google of abusing its dominance, it will be another illustration of just how important a role the Californian company plays in every corner of the global economy.